As we age, our bodies experience more wear and tear which means as we get older, we naturally spend more time in the local pharmacy picking up on the shelf or over the counter medication. If we’re unable to collect it for ourselves, it’s often a carer or family member that takes responsibility. For Care Home providers like Encore, pharmacies are the ideal environment to reach their key demographic. Branded pharmacy bags are distributed directly into the hands of consumers picking up their medication by the pharmacist – known to be one of the most trusted health professionals in the industry. The public tends to trust their pharmacist with health-related concerns and messages branded on the bags help to prompt questions. There are a number of benefits to pharmacy bag advertising, including the fact the message is on a bag containing medication means that the message is more likely to be read and in full. The majority of medication is taken home and kept in the bag which offers multiple opportunities for reinforcement, not to mention the ability for consumers to research an opportunity like Encore Care Homes online or over the phone in the comfort of their own home. 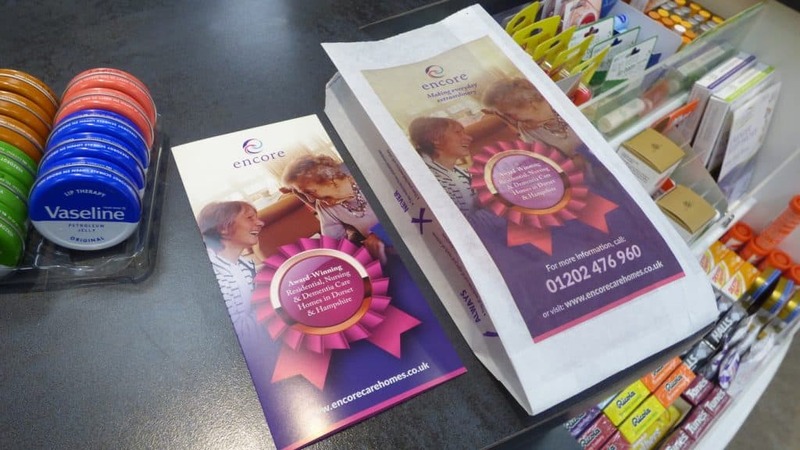 Encore run a number of care homes in Bournemouth, Christchurch, Fareham, Poole and Pembury so targeted their pharmacy bag advertising in local independent pharmacies located in proximity to their various care homes. Knowing that when the time comes to make the decision to move yourself or a family member into a care home, it’s most often to a place close to the neighbourhood you currently live. Pharmacy campaigns can be targeted locally, regionally or nationally with the Tabletalk network extending to thousands of independent pharmacies across the country.